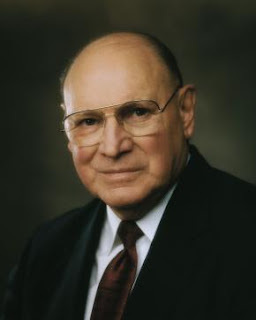 as most of you already know, Joseph B. Wirthlin passed away last night in his sleep. at age 91 he was the oldest living apostle of the Church. his sweet nature and humble spirit will be remembered. he has always had a special place in my heart and I love to remember his talks on compassion and kindness, but this past conference talk was especially wonderful. i didn't know that. sad day. but i do love that talk. it was an amazing talk. he will be missed. thanks for this post. Wow I hadn't heard about his passing. Thanks for posting this. I really love that talk too. I will miss him, he was a great leader. His last two conference talks will be remembered for a long long time. He was a goody, that's for sure. My favorite talk this past conference. He will be missed. Thanks for the reminder. I loved Elder Wirthlin! He seemed like the quietest most humble little man. I LOVED his most recent conference talk. It was my favorite talk from this conference. Sad to see him go. But I bet he is pumped to be back with his wife. I'm glad you posted about this sweet and dear man. I agree with everyone else!! I will try to always remember not to act like anyone has offended my dog as I am driving down the road. I loved the "come what may and love it" so much I posted it in my house. He will be missed.